Learner drivers could get motorway lessons, for the first time, if a government plan to improve road safety is given the green light. The change, which could come into force in 2018, will allow qualified instructors to take competent learners onto the motorway for lessons in cars with dual-controls. The plan is part of a wider government initiative to cut the number of accidents involving new drivers. In 2015, 120 new drivers died on Britain's roads, although the majority of these - 80 per cent – occurred on rural roads. Just four per cent of deaths happened on motorways, while the remaining 16 per cent of fatalities occurred on urban roads. It is currently illegal for learners to receive motorway lessons, although new drivers can get motorway instruction as part of a Pass Plus course. However, according to government figures, just three per cent opt for Pass Plus after passing their practical test. 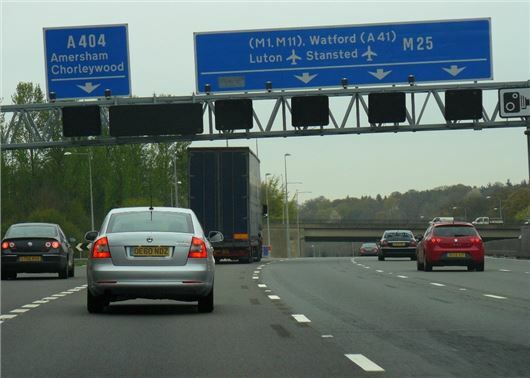 How to enter and leave motorways, correct use of lanes and how to overtake. Experience driving where greater demands are placed on driver’s skill, observation, anticipation, planning and concentration. Demonstrate importance of route planning, taking breaks and ensuring roadworthiness of vehicle. Andrew Jones, Road Safety Minister, said: "The proposal will enable novice drivers to experience the broadest possible range of driving experiences in a supportive environment, helping them to be better, safer, independent drivers. Motorway lessons will be voluntary and only permitted where the learner is accompanied by an approved driving instructor in a dual-controlled car." I read the press articles recently about learner drivers receiving lessons on Motorways and don't think this is a bad idea but it so much depends on who is with them and of course the use of a dual controlled car as those first moments entering the three or four lane carriageway could be very daunting. However, what is the difference between this and driving on a three lane road such as the North Circular around London which is very similar to a motorway in terms of structure? Even if the top speed on this road is 50mph this is still faster than most learners have been used to. I have seen appalling driving on this particular road and people regularly do 60-70mph on stretches where there are no cameras. A learner would find this very scary but it would also make them aware of how this particular road has variable limits so there are quite a few issues to deal with. Have just given this as an example and am sure that around the country there are other roads that are not motorways but are structured in a very similar manner. Given the way weather affects drivers I wonder whether it would be more useful to give learners training on a simulator showing the effects of severe fog on a road? Anyway, anything that helps people improve their road skills is to be applauded. Television adverts to educate drivers were helpful to many, not just the inexperienced. Parallel parking, joining and leaving motorways, headlight etiquette and most importantly-giving signals, 'appropriately and in good time!' Something that's gone by the board (what about those loonies signalling right when turning left off a roundabout). Whilst not everyone is close to a motorway, this is not a reason to deny this near essential training to those who are. Until there is a change, I used dual carriageways building up to 6 lane roads like the A3 which is little different to a motorway to train 3 members of my family. They all passed first time had then experienced motorway training under my supervision building up to the M25 in all conditions. The present system is lacking in so many areas and some candidates have very limited hours driving experience. Are novice drivers confident of the very different demands of town v country driving and reading the road ahead? My family members all found the Surrey Hills a totally different experience to the suburbs. Central London (or any other city) brought home the need to really look in both wing mirrors for cyclists and motor cyclists. Night time experience in addition to daytime practice, varying weather conditions and an introduction to driving over increasing distances are also important. Exactly Mi16, we have duel carriageways to use that can give learners drivers a real taste of motorway driving, why is society in so much of a rush to let them lose on the motorways, most trucks use motorways, and do we really want learners drivers forcing them into dangerious situations. Ww have all seen what happens when they are involved in a collision. I think it's a great idea, long overdue but, it must be compulsory and should take place just before the driving test. It's ridiculous to assume a leaner driver without motorway driving experience is competent on a motorway after qualifying to drive. Obviously it should also be included in the test. My experience is, the motorway driving in this country is of a poor standard, the lack of lane discipline is the main course of congestion, drivers should use all lanes moving to the inside lane as soon as possible. A long overdue idea. A learner driver, under instruction in a dual control car would be a lot safer than 50% of the other road users. It's a very good idea. There used to be pass plus, is it still available? Make it compulsory, simple, basically 6 x 1 hour lessons prefably in mixed conditions. Also a compulsory speed awareness session would probably be useful. get a flying licence - it will entitle you to fly, by day only, in a single engine plane, not less than 1 mile from cloud horizontally and 1000ft vertically. if you want to fly in the airways (like motorways in the sky) you have to have an airways licence, want to fly at night - get a night licence, want to fly fast plane with two engine - get a multi engine licence, want to fly in cloud - get a licence to do so. this is well overdue. you can pass your test on the scilly isles, with no traffic lights or roundabouts, and go over to the mainland, buy a porsche, and drive up to scotland on the motorway without taking a break ! this has got to be bonkers ! I took an experienced driver on an observed advanced drive. They lived in a city and were comfortable at 70mph on a motorway but were in near panic on a single track road which requires a whole new driving technique. I would make the driving test as is but until a more advanced test is passed you would have to drive with 'P' plates. This more advanced test would include all types of road and conditions even if some eg. fog employed the use of a simulator. I think it is a bad idea for several reasons, if we allow learner drivers on motorways do you seriously think it will only be duel control cars with qualified instructors ??? Or do you think we will get non qualified instructors who can barely drive properly themselves and most who cant, will be using this to take their offspring onto motorways, I hope you have the intelligence to realise the latter is more likely. I suggest you go and get a coffee this is going to be a long one. It isnt just about speed, its what happens when it all goes wrong, a typical RTC on a single track will only involve a few cars, next time you stop at services, go onto the walkway and look down and try and count the vehicles who pass you in just 30 secs, then imagine them all crashing into each other with your children in one of those cars, underneath an artic, because that is what will happen. One of the reasons our motorways are safer then any other road is because we keep slow traffic off them, as well as learner drivers, and lets not forget that because of this rule most car drivers on motorways are of a minimum standard or at least have the ability to be so, so what you are talking about is allowing people who cant drive to mix with fast moving busy traffic, say on the M25 at 1600 hrs, are you seriously suggesting that is a good idea ?? I think a much better idea is to make it mandatory to do a 2nd test before allowing drivers to go on motorways. thereby making it legal but only if they pass, like they do in Finland with the summer and winter tests of which you have to pass both if you want to drive all year around. And lets not forget the Duel carriageways on the A roads are open to everyone, so its a risk we just dont have to take. And let me chuck some stats at you, more accidents occur with learners drivers then with qualified drivers, so nect time you see a learner driver do someyhing silly as part of their lrearning process ( just like we all did ), imagine that mistake on the motorway with 50 cars behind him travelling at 2, or 4 times the speed ?? Still think its a good idea ? Finally, do you think that only controlling your speed and braking is going to be enough to prevent a collision at 70 mph ? If you really do think that I wonder if you should be thinking about getting a bus pass and burning YOUR license. While there may be duel controlls there is only 1 steering wheel and if the superviser has to grab the wheel while on the motorway to prevent a collision, then my friend its already too late.